"Running with rhinos" is not a euphemism--not when you're ground support for the International Rhino Foundation's Rhino Conservancy Project. 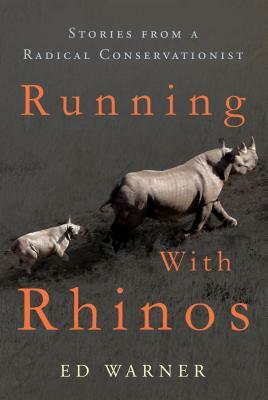 In Running with Rhinos: Stories from a Radical Conservationist, Warner takes readers along as he weasels his way into becoming volunteer ground support for the International Rhino Foundation's Rhino Conservancy Project, or "Rhino Ops," in Zimbabwe. It is gritty, sweaty, sometimes scary, and exhilarating work. Warner succeeds in telling a remarkable story of the extraordinary bonds between humans--and their dedication to protecting endangered animals--all while weaving eye-opening stories about the flora, fauna, geology, geography, and politics of sub-Saharan Africa. Ed Warner is a noted philanthropist and conservationist. In his career as an exploration geologist, he discovered and participated in development of the Jonah/Pinedale Fields, the third largest natural gas accumulation in US history. Since leaving the natural gas business in 2000, he has pursued philanthropy full-time. Dr. Warner earned a BS from Colorado State University, an MS from UCLA, and an honorary doctorate from Colorado State. In 2005, Colorado State named the College of Natural Resources after Ed. He has lectured on geology and cooperative conservation at numerous universities. He also writes book reviews for the Denver based Bloomsbury Review. Currently, Dr. Warner is a Trustee of the Denver Museum of Nature and Science and a Director of the Bird Conservancy of the Rockies and the Sand County Foundation. His previous service includes having been a Trustee of the Geological Society of America Foundation and the American Geological Institute Foundation.